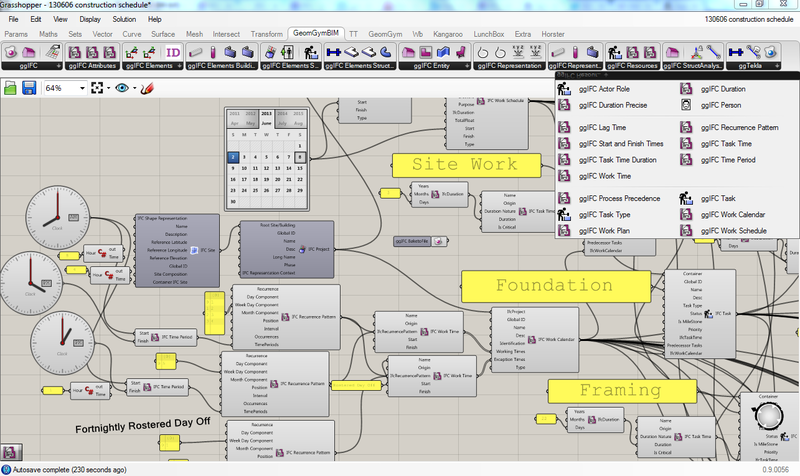 Recently I've been working on enabling more dimensions to Grasshopper BIM, primarily Planning and Costing. I've just posted an installer (http://www.geometrygym.com/downloads ) that's capable of generating the attached program example (which is just like a Gantt chart just in Grasshopper format). This example creates a residential project construction program. It demonstrates nesting tasks inside others, nominated precedence dependency (including lag time and start-finish or start-start type relationships) and nominating task duration. It's also possible to assign task to work calendars defining working times or exceptions (such as holidays or rostered days off). At the moment there's not components to provide feedback such as collated/aggregated scheduled finish time etc, but this is certainly something I'll pursue. Of a higher importance is probably to develop an importer for existing management software such as Microsoft Project (or other suggestions made by users) so that gantt charts (in a more typical/recognizable format) and reports can be generated there. I've also started work on costing and resourcing metrics which I'll be posting soon. I think what would also be impressive/useful with this is assigning products to tasks and creating a virtual build construction sequence within Grasshopper (or other software). And remember this is all being managed within the IFC OpenBIM framework, so if you already use software capable of importing the model data, it's a really powerful opportunity. At present I'm only generating IFC4 models as there are significant improvements in this area (but also means significant differences from IFC2x3) but if existing software only using IFC2x3 can be used I'll look at enabling "equivalent" IFC2x3 where possible. Look forward to hearing suggestions and requests.